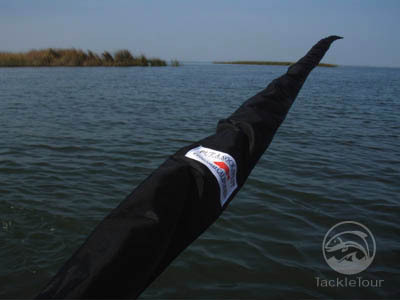 Introduction: When you're as avid a tackle collector as a TackleTour Editor, you're on the constant lookout for storage solutions to maximize efficiency and overall capacity. Back in October of 2005, we shared with you a rod storage solution for your bass boat by Stor's It that consisted of a series of rod covers. Today we show you a similar product that carries task of rod storage one step further. 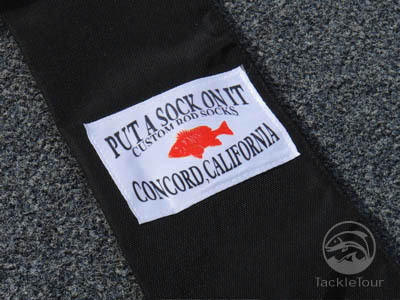 Introducing the rod socks by Put A Sock On It, a company out of Concord, California. 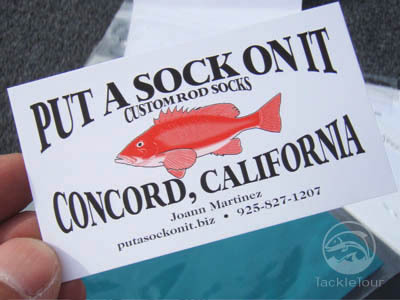 Impressions & Background: Put A Sock On It was founded in 2001 by Joann Martinez, an avid tournament bass angler. Their products, which include a full line of rod socks and lure keepers are made with 600-denier nylon, a thick and durable material, and offered in four different colors to help in recognizing your different combo's. Can't find what you want? Put A Sock On It also takes custom orders and will build a sock, lure keeper, or combination thereof to suit your needs. The Field Tests: We ordered just a couple of items to get a sense of their product offering and quality and threw them right into our mix of storage needs. Of particular interest to me was their rod sleeves or socks. Storage: The Put A Sock On It rod sock comes in five different lengths to handle rods anywhere from five feet in length on up. The majority of my sticks are all around 7 foot in length, so this was my starting point. 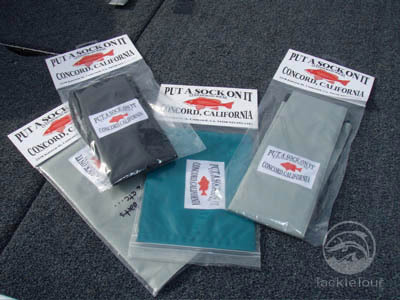 The material for these rod socks is a tough, 600-denier nylon that slides easily over your rods. 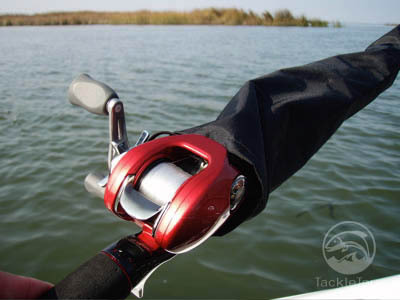 There is a loop at the bottom of the rod sleeve to hook over your reel or over an open ended hook hangar. 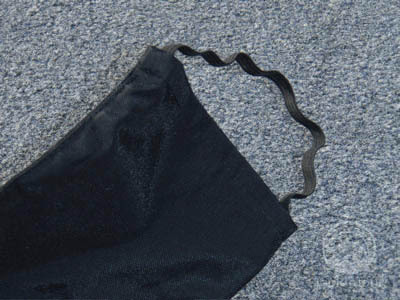 The socks are made to accommodate spinning and casting rods interchangeably. Casting Rods: My initial test with this product was with my Daiwa Steez STZ711HFBA Compile-X rod. I slipped the sock over my rod, looped the elastic band over my TD-Z Custom 103HL, and slid the combo into the bottom of my rod locker underneath my previously installed rod rack. This is a task that, without a rod sleeve, is sticky at best due to the severe angle I need to work the rod in order to get it in underneath my storage rack. The sleeved combo slid in rather effortlessly thanks to the Put A Sock On It rod sock. Spinning Rods: I tried this same test with my Megabass F3-610DGS Aaron Martens Limited spinning rod matched with a Daiwa Exist Steez 2004 and was met with the same smooth operation. This was a huge bonus as I am otherwise unable to carry spinning rods in my rod locker for the fact the guides on spinning rods stand out too far from the blank to fit into the tubes of my storage rack! This rod sock enables me to slide spinning rigs underneath the rack so they can sit at the very bottom of my rod locker beneath my casting sticks. I was pretty psyched! 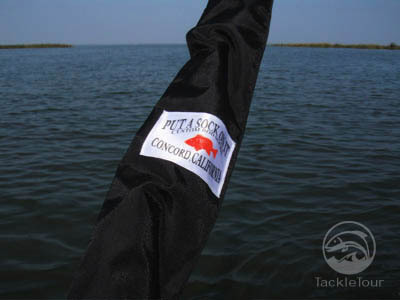 Convenience: The next real test came during a day of fishing where I was sliding my rigged spinning combination in and out of the rod sock with hooks exposed and everything. To my surprise I was able to get my spinning rig in and out of sleeve with no incidents of the hook catching onto the rod sock's material. This is not to say it won't happen, as hooks have a way of getting into everything - heck, that's what they're supposed to do! But this tiny bit of insurance led to quick combo changes as I was able to pull this rig in and out of my rod locker with little worry. Don't get me wrong, it was still a bit time consuming sliding the socks on and off my combo, but knowing the socks had some resistance from catching on the hooks made it a bit easier deal with. Fit: If I had one complaint with this product it's in the actual fit. The elastic band at the bottom of the sock is of a fixed length and a tad on the flimsy side for me. It feels as if, after long term use, it might get stretched out therefore taking away your ability to lock the sleeves on securely. Some type of adjustable securing strap might be a better long term solution and help provide a bit snugger overall fit over the rod. Other Benefits: The one real interesting benefit of the Put A Sock On It system of rod sleeves is the loop at the top of the sock giving you the ability to hang your sleeved combo on a wall in your garage. 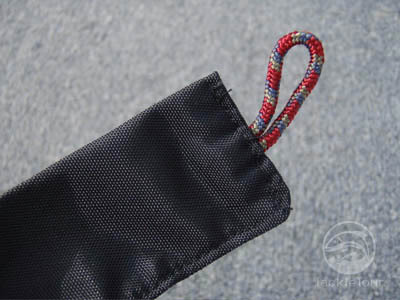 This loop up at the top of each rod sleeve, is sewn in very securely enabling you to hang your combo from a nail, hook or other bit of hardware. If you have the wall or ceiling space, this is a rather convenient way to get your rigs out of your boat and still keep them out of the way and protected. 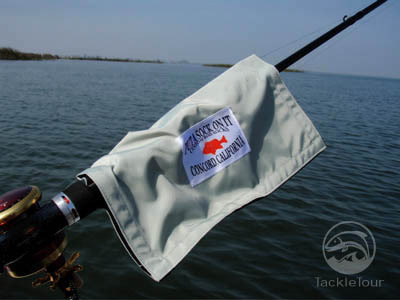 The elastic band at the bottom of the rod sock ensures your combo will not slide out the bottom when hung vertically. Other Products: Put A Sock On It also offers a wide assortment of lure keepers designed to protect your stored rods and reels from getting scratched and prevent any number of crazy things from happening when baits come free from their hangars when stored on the rod. These keepers are particularly convenient for transporting pre-rigged swimbait combo's. Availability: Put A Sock On It has their products distributed through several stores here in Northern California. For availability elsewhere, you can visit their website for contact information. Emails and phone calls are answered promptly. Can't find them in your local stores? Give them a call or shoot them an email and tell them TackleTour sent ya! Conclusion: More and more similar products are making their way to the marketplace. Why not? If you value your gear it makes a lot more sense to use a system like this than leave your expensive combo's laying at the bottom of your rod locker with no way to separate them from one another. Tangles, scratches, broken guides are just a few of the end results from not having a properly organized and easy to use rod locker. 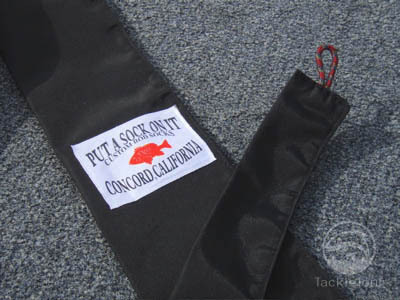 The Put A Sock On It rod socks have the added benefit of providing a way to hang your combo's with the socks still on them protecting them both in and out of your boat and saving you just a little time when loading up for the next trip. Get them in different colors to help in organizing and recognizing which combo's are what and even have them built to order if you need something special. 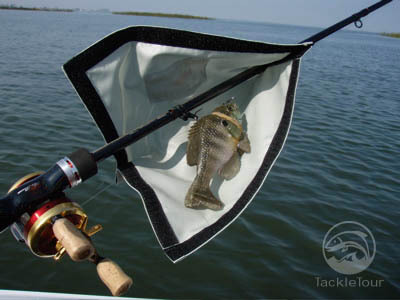 If you're ready to get your rod locker organized you might want to consider Put A Sock On It.